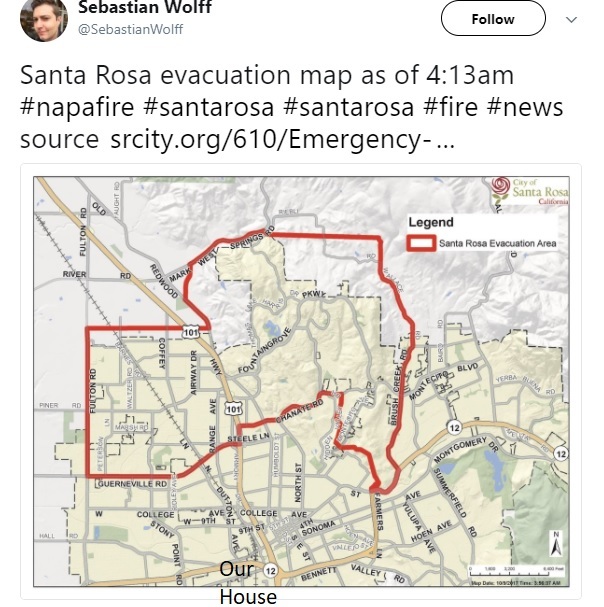 We woke up this morning in Santa Rosa to smoke and sirens. Last night’s winds fanned a bunch of wildfires in the North Bay, and parts of our town are destroyed. We’re a few miles south of the evacuation zone, things might shift around, but at the moment we’re staying put. Here’s what happened. Last month we started hitting data overage charges. That hadn’t been an issue before, but we dropped by the AT&T store to review our options. The sales rep pushed hard for an upgrade to an unlimited data plan for an extra $5/mo. Not really necessary, we’re almost always on WiFi, but OK, sure, five bucks, why not? Turns out the rep neglected to mention that the upgrade removed our tethering capability. This is not something you want to find out while breathing smoke, hearing sirens, and trying to make sense of the latest evacuation map for your burning city. According to the rep we spoke with today, this critical fact about tethering is often omitted from the upsell pitch. We’ve got it turned back on now. I’m awaiting a callback from a manager’s manager about the additional $30/mo they plan to charge to restore a capability they hadn’t told me they were taking away. This is a small thing. We are, of course, infinitely luckier than a bunch of folks in our town who will return to the charred foundations of what were their homes. We’re mainly thinking about them today. But while we’re waiting for the ash to settle, I just want to say: Really, AT&T? Author Jon UdellPosted on 9 Oct 2017 Categories .